Rain is a photographer who fell in love with her best friend, Galen. When Galen dies in a car accident, Rain loses herself and her creative passion. She skips Galen’s funeral and sinks into a 6-month-long depression. The only thing that makes her come up for air is the chance to photograph an Indian camp for the local paper. Rain is one of the few Indians in her small town, but doesn’t feel connected to the culture since her father is white. 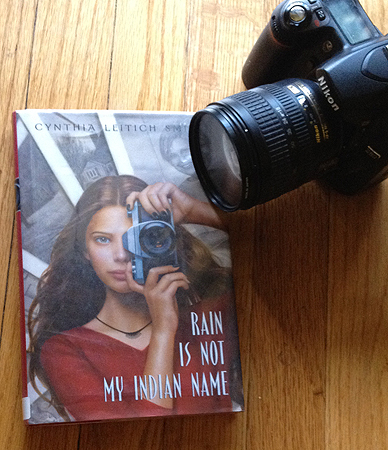 After photographing the camp and learning that even her former friend, an African-American, is proud of the Indian blood in her lineage, will Rain find a passion for her people? The themes of the book are photography and Native Americans, but neither topic is explored to its full potential. The storyline of Galen’s death is the only one that is satisfactorily resolved; the others fade out before they’re completed. Rain is a flat character; teens would more than likely find it hard to relate to her. She’s interested in photography, but doesn’t seem passionate about it, and nothing else about her personality sticks out. Rain’s grandfather, who is only present via postcards sent from Vegas, is more interesting than the main character herself. This book is more appropriate for younger readers, probably topping out at age 12, though Rain herself is 14. The book is also only 14 years old, but comes across as extremely dated; the story isn’t strong enough to be classified as timeless. Some of the sentences were awkward and wordy, making it hard to comprehend what was being said, and making the reader very aware that they’re reading a story. Overall, the book wasn’t too engaging, so I wouldn’t recommend it even for younger readers. 343GUILTYSPARK. How To Make A Pinhole Camera. Instructables, n.d. Web. 5 July 2015. For those who don’t have the resources, you can still have fun “developing” photos. Have teens use their camera phones and the library’s iPads to take journalistic photos of each other in the stacks and around the building. Print them off and send home copies, hang them up, and post them on social media to show what’s going on at the library. You can even make the photos look like they came from a pinhole camera by using a needle to poke a hole in a small square of cardboard and tape it over the camera lens to let less light in. Teens will have to be more conscious of how they frame photos with these limitations! Teicher, Jordan G. A Photographer’s Moving Tribute to the Pine Ridge Reservation. Slate.com, 20 Feb. 2014. Web. 5 July 2015. Huey, Aaron. Pine Ridge Community Storytelling Project. Cowbird.com, 20 Mar. 2012. Web. 5 July 2015. Huey, Aaron. America’s native prisoners of war. Ted.com, Sept. 2010. Web. 5 July 2015. Edwards, Carol A. "Rain Is Not My Indian Name." School Library Journal 47.6 (2001): 156. Business Insights: Essentials. Web. 5 July 2015. Smith, Cynthia Leitich. Rain Is Not My Indian Name. New York: HarperCollins, 2001. Print.